1200 tons of pressure is used to affix the thermal compact-base to the bottom of the Carl Weill thermo cookers. This compact base is the key to Carl Weill's energy saving method. Made of a 5 layer patented base of metal alloys, it enhances heat conductivity so that heat is evenly distributed and stored.This engineering feature enables food to be cooked on a low setting and in less time than traditional cookware increasing energy savings up to 70%! 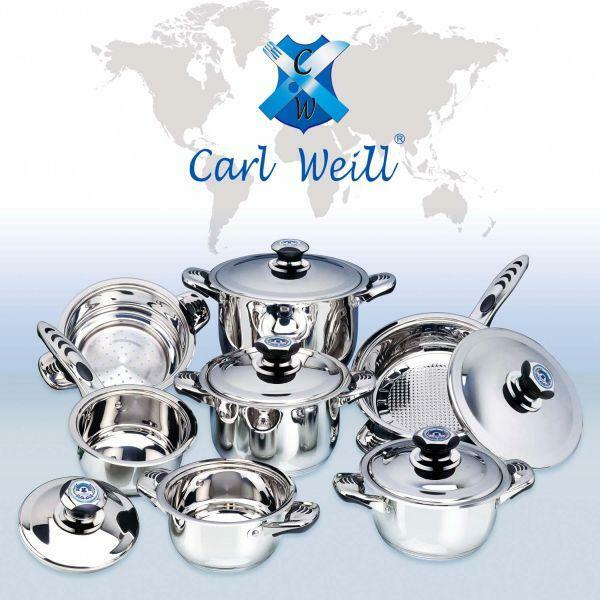 One of the major advantages of Carl Weill's unique cooking system is that different cookware units can be stacked, in order to cook multiple dishes using only one burner or hot plate. Lowest price quality surgical steel cookware. Perfect for wedding and anniversary gifts. Go HERE to see the individual pieces in the set.